Novo7 Tech, the famous distributor has announced the THL T200 Cyborg Octa core smartphone. 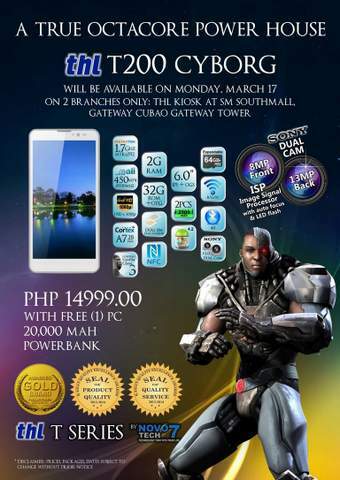 The new T-200 Cyborg will be launched on March 17 in Philippines. It comes with some amazing TOP specs and all that under a price of PHP 14999. The company is also offering some freebies with the phone, like free 20,000 mAh Power bank. It comes with a 6 inch IPS 1080p FHD display which makes it perfect Phablet. It is powered by 1.7GHz 8-core processors coupled with Mali 450MP4 GPU and accomplished with 2GIGS of RAM. There are tons of things in the smartphone to make you please. It has 3G, HSDPA+, WiFi, Bluetooth v4, GPS + A-GPS, micro USB port with OTG support and 3.5 mm audio Jack. It is DUAL SIM phone with Dual Standby. The THL Cyborg T200 houses 2500 mAh battery, which seems to be OK for normal usage. It packs with a 13-megapixel ISP primary shooter and a 8-megapixel secondary shooter. The phone can record and play High Defination 1080p videos. It comes with 32GB of ROM ( internal storage ) and up to 64 gigs of expandable storage. The THL T200 Cyborg looks at this price tag and scores more than 20K in AnTuTu Benchmarks. The Camera on the phone is manufactured by SONY and has F/2.0. It would compete with Myphone Infinity and other Mediatek powered flagships.